KCPP awarded the first ever Paul Jolly Compassion Award by the Petco Foundation. In 2017, we provided care for 10,319 dogs, cats, and other small pets. New families adopted 6,619 pets from KC Pet Project this past year – the largest number of pet adoptions in the history of Kansas City’s animal shelter — and we returned 2,222 additional pets to their homes or found placement for them through another shelter or home-based rescue group. We ended the year with 528 dogs, cats and other pets in our care. This allowed us to achieve a record-setting 95.7%% Live Release Rate for 2017! Despite a 6.6% increase over last year in pets surrendered by their owners and a nearly 4% increase in the number of pets that arrived this year, we were still able to decrease euthanasia to a record low number while saving 9,459 pets – the largest number of dogs, cats and other pets saved in Kansas City’s history. From neonatal kittens, puppies with ringworm, or pets with injuries and medical conditions – to small companion pets like rabbits and rats, and adult dogs and cats needing an environment other than the shelter – hundreds of foster families opened their hearts and homes to thousands of pets from our shelter this past year. Our foster families cared for 1,466 cats and kittens (147 adults, 1319 kittens) and 895 dogs (493 adults, 402 puppies) in 2017! Not only did they provide care, socialization and love, but our foster families found new homes for 752 of those pets through KC Pet Project’s Foster Ambassador Program in 2017 and we welcomed 270 new foster homes to our KCPP foster community last year. 71 feral cats entering our shelter in 2017 were sterilized, vaccinated and placed in the care of responsible caretakers with horse barns, farms, or nontraditional homes such as warehouses or businesses. Our adoption numbers were the highest we’ve ever had, and in fact, more cats were adopted from KC Pet Project than dogs for the first time in the shelter’s history! We found homes for over 500 more cats in 2017 than 2016, and were able to transfer 314 cats IN to the shelter this past year from other local shelters and municipalities that were full. Over 500 more cats were adopted in 2017. In fact, more cats were adopted in 2017 than dogs for the first time in the shelter’s history! We launched a new initiative in 2017 to find foster homes for neonatal kittens that come to our shelter, The Bottle Baby Squad! Dozens of new volunteers signed up to foster kittens that come to our shelter, and we’re looking forward to expanding this program in 2018. KC Pet Project now has 7 Petco stores in the metro area where you can adopt out cats with the Liberty, MO added in 2017. And in 2018, we’ll be adding a new store in the metro area: Belton, MO! We’re so proud to partner with Petco on this amazing program, and 733 cats were adopted in 2017 from the six Petco stores where we provide cats for their habitats. Our program, SNAP (Safety Net Assistance Program), provides over 50,000 meals a year to pets and their owners who can’t afford or do not have access to proper food for their animals. Our KC Rescue Runners running team had its inaugural year and ended with over 60 new members and raised $6,700 to support our pets in 2017. Our new program, Snuggle Service, raised thousands of dollars to support our pets and brought joy to many local businesses, schools, etc. We’re incredibly proud to share this 2017 update with all of you. We’re so grateful for our amazing and dedicated staff, board of directors, volunteers, adopters, donors and community supporters that help us save more lives every day. We continue to be committed to being a lifesaving organization and a safety net for both people and pets from right here in our own community. We’re looking ahead to bigger and better things in the coming year and hope you’ll share our stories, follow us through social media, and support KC Pet Project in 2018. 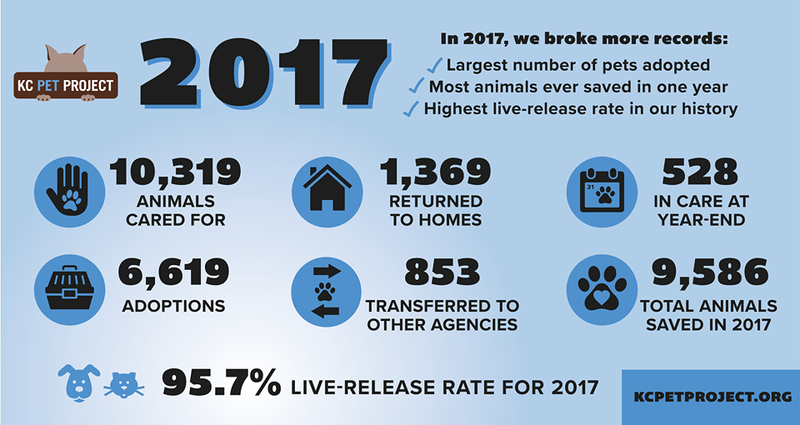 While they were many, one of the major successes was that we finished 2015 with a 93.4% live-release rate – the highest in the history of the Kansas City, MO animal shelter. Adoptions have increased 146% since KC Pet Project began operating the shelter in 2012. The number of pets surrendered by their owners was down 18% in 2015 due to efforts by our staff in providing counseling, food, medical, and training resources to help families keep their pets.